Dresden Lane: Improv Quilt Done! This is one of my oldest UFO's - finally complete! Yay! For the longest time, it sat on top of my bureau as a baby-sized top - I was forever unsure if I should finish it as is or just keep adding to it, as I had originally planned. I finally just went for it and dug out all sorts of scraps and completed it - adding 5 more pieces of Heather Ross' "Princess and the Pea" print. 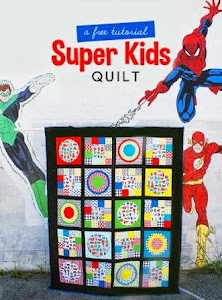 This was a great scrap buster, but I have to admit that I did cut into some larger cuts to add variety to the quilt. 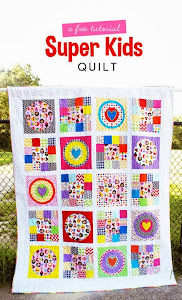 I have to add that this was a great project to use all those cute scraps people send you when you swap fabric with them. I quilted this quilt at my friend Joanna's house, as she had kindly offered to let me try out her Juki. I have to say that I loved using her machine. The large throat space was a real dream and the speed with which it sews (thanks to an industrial-power motor) made quilting this baby easy. I also felt brave enough to try a new-to-me free motion quilting technique: swirls. I love how it changes the texture of the quilt - be warned that it did take a lot of thread - I almost used up a 1,100 yd spool of Gutterman thread (the largest Joann's carries) and probably went through at least 12 bobbins. I rarely do pieced backs because: #1 I am lazy and #2 I love the look of a big, awesome all-over print on the back. But I knew I needed to use up some of my stash, so here is the result: The largest piece, Prints Charming Rainbow Garden is one of my faves. I also pieced the batting to finish this quilt and will have a tutorial on how I did it tomorrow. This quilt was a very economical project for me - I didn't need to go out and buy something specific for it- just used what I had on hand. How funny, I was admiring your quilt over at Joanna's and didn't realise it wasn't hers until she pointed it out. Then I came here via a link to your joining batting tutorial from another blog. Thanks for sharing wonderful things. Fabric Friday: More Birthday Goodies!